There are certain watches that we love that I have always wanted to sell. 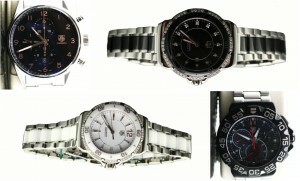 Watches that are high quality, mid-luxury and great prices. 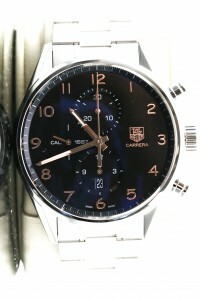 The Tag Heuer is one of these watches. This is a watch that I have been on the look out to buy used for some time, but the used market for the Tag is not that large, so I started to investigate the new Tag Heuer market. It took some time to find the right resource, but one thing that I love to do is investigate to find the right deals, and luckily enough, I found the right deal to be able to bring brand new Tag Heuers to Jonathan’s Fine Jewelers. And, we have couldn’t wait to tear into those boxes and unwrap these watches and put them in the case, because these Tag’s are sick…in a good way! What makes this watch company different from others? Most of the models are built around various sports and activities. This is where their inspiration comes from, and because of this, Tag Heuer has been named one of the three most innovative Swiss watch-making companies. We carry a large selection of Tag’s to choose from, but I am a biased watch guy, so I picked my four favorites, two for the men and two for the ladies to highlight. The Tag Heuer Carrera was named after the Pan-American Mexico road race and has been around for over 150 years. The watch has been revamped this year to be finer than ever. The Calibre 1887 Automatic Chronograph is 43 mm and has a polished stainless steel case with rose gold Arabic numerals. A series of 60 tests have been performed on this watch, so you know you are getting a watch that is water resistant, resistant to UV aging, extreme temperature resistant, traction resistant and vibration resistant just to name a few. And, the best part is that you will look good while being so resistant to all these elements! The Ladies Stainless and Ceramic Tag Heuer Formula I is a fabulous watch, especially with diamonds surrounding the bezel. We have this watch in white or black ceramic and with the diamond markers or without the diamond markers. Either way you want it, this watch is beautiful. This watch offers a screw in crown and luminescent hands and markers (if you don’t have sparkly diamonds!). Automatic with a date window and scratch resistant sapphire crystal, this watch says luxury and style while still being sporty enough for everyday wear. The Mens Tag Heuer Formula I is the Granddaddy of all the Tag sport watches. Inspired by the extreme performance of the McLaren Formula 1 race team, this watch is worn by champion race car drivers and by men who just enjoy a good looking watch that can take a beating and keep on ticking. This watch is sturdy. It is made of this new type of ceramic that was developed especially for this watch. The Tag Heuer Formula I for men has everything you would expect from a Tag and more, including a double security-folding clasp to prevent the watch from accidentally opening during any extreme sports you might be partaking in. Why Buy a Tag Heuer? Did I mention if you get them through me, below retail with a full warranty?